The 750th anniversary of the birth of the great poet Dante Alighieri is being fittingly celebrated today in Italy. Oscar-winning actor Roberto Benigni will visit the Italian Senate to read from Dante’s masterpiece, The Divine Comedy, to an audience that will include Italy’s president. The reading will be broadcast to the entire nation, along with a new musical composition in the poet’s honor. According to the ANSA.it website, there are many events planned to honor the poet — at least 187 in Italy, and more than 173 in other countries. This seems only fitting for a poet who framed one of the most ambitious and intriguing literary works that I’ve ever read. It’s dispiriting to realize that Americans are unlikely to see similar honor accorded to any time-tested literary figure, though Dante lives on among those who relish the dance of words and ideas. My initial response was a full stop. What did it mean? I paraphrased it to “The glory of God shines throughout the universe and reflects from every object in proportion to the object’s worth.” I don’t think that it is all the stanza means, but it’s a start for thinking about the idea. When I come across a thought I want to ponder, I copy it in my commonplace book. Sometimes I will paraphrase or narrate at this point. Then I go back to the original text and begin annotating, which is my way of thinking through the idea and in some cases, opening a conversation with the author of the text. For translated works, I try to read the passage in more than one translation to catch a variety of nuances. The quote above is from the Ciardi translation, and I notice that it reads differently in other translations. So that is more to think about. In addition, it’s important to read through the translator’s introduction and notes. The introduction will usually explain the translator’s purpose and method, and the notes clarify allusions and unfamiliar concepts. You’ll need a translation with clear notes, because Dante’s work is overflowing with allusions to everything from scripture to philosophy, politics, mythology and beyond. While it’s possible it can be appreciated simply as a story poetically told, I don’t believe it can be fully understood without excellent reference notes from the translator — few of us are that well educated. Why assign Dante to students? So if it takes that much work to absorb and consider Dante’s ideas, why assign even a portion his work to high school students who are probably going to grasp only a fraction of its beauty and depth? I assign it because it’s beautiful and profound and should be read. I also assign it because even a superficial reading (or listening) can begin to make words, images, and concepts familiar, and each re-reading will uncover another layer of virtue, beauty, and creativity. With the context readings included in the EIL module, I believe students stand a good chance of beginning a lasting relationship with this remarkable poet. You’ll note that Dante’s Inferno is not assigned until World Literature (12th grade +/-) because I believe students need a bit more maturity than the average 8th or 9th grader, and it helps a lot if they’ve read other classics before approaching it. That initial reading will place “pegs” of knowledge in the student’s mind, and future readings will add additional layers of understanding. If you add narration (oral or written) to the reading of each canto, the road to understanding will be considerably shortened. I would have preferred to assign the entire Divine Comedy, but four weeks is simply not enough to study it all. I would rather have students read a bit less of it and understand it, than to read the entire work and suffer from literary indigestion. Rushing through any classic is a way to get literary indigestion and is certainly not conducive to loving the great work. Though I know that the English translation is but a pale shadow of the The Divine Comedy in its original Italian, I agree with T. S. Eliot’s assessment that “Dante and Shakespeare divide the world between them.” So if the president of Italy can find time in his schedule to hear a reading in Dante’s honor, the least I can do is to persevere in pursuit of fuller understanding. At the rate I’m going, it will be years before I’ve read it enough times to feel truly intimate with it, but I do plan to keep reading. Dante is worth it. How will you celebrate Dante’s 750th anniversary? You don’t have to understand Italian to feel the power of this beautiful work. It makes want to drop everything and study Italian! You can see three old translations of this canto at DanteInferno, but there are many more translations available. The one I’m currently reading is John Ciardi’s translation. It contains all three parts of the Comedy, and I think it is one of the simplest, most approachable translations, with outstandingly helpful notes and an almost perfect layout. The print is clear, the book lies flat, and there are nice margins for annotating. For each canto, there is an introduction that previews what is to come. This is followed by the poem itself, uncluttered with footnote markings or annotations. Those come at the end of the canto, and it’s easy to flip back for additional information. I like having the poem uncluttered because I find extra stuff on the page distracting when trying to immerse in Dante’s flow of thought. And I love having all three volumes in one book. They form one story, so why not? Next time I read it, I will probably choose a different translation, just to increase understanding. I chose Ciardi for clarity, so I will choose the next one for poetic qualities. I’m considering translations by Anthony Esolen or Allen Mandelbaum, but there are so many — I’d like to sit down and look at them all, and then decide, because it’s not only the quality of the translation, but the layout of the book that factors in to whether it is enjoyable to read. There is a translation of Inferno by Dorothy Sayers that has very good notes, but I don’t believe she translated the other two parts of the book. At DigitalDante, a website from Columbia University, you will find detailed articles about Dante and his works, beautifully presented. Dr. Sebastian Mahfood has created short video commentaries on each canto of The Divine Comedy, and you’ll find them on Excellence in Literature, along with a few of the amazing original Gustave Doré illustrations. So far we have up only Inferno, but are hoping to add the rest soon. Rod Dreher at The American Conservative has a number of good posts about Dante, with a focus on Paradiso. The ever-brilliant T. S. Eliot offers a vigorous defense of Dante’s work in this 1921 essay from The Sacred Wood. A. S. Kline at PoetryInTranslation.com offers extensive mediations on the Divine Comedy from a modern, secular viewpoint. 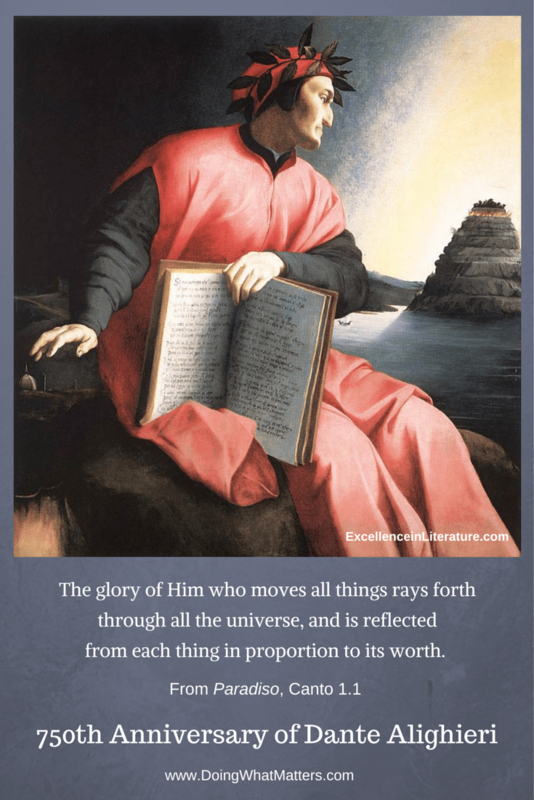 Christian History Institute provides a list of resources for the study of Dante and his work. The Dartmouth Dante Project has a searchable database of over 70 commentaries on Dante as well as the full Italian text of The Divine Comedy. We are making good progress on moving the Everyday Education site to the new format (at least I feel that there is light at the end of the tunnel). Most of the book pages are up, and I’m starting to work with getting everything properly connected and organized. If you visit, please let us know if you notice anything strange, or if something doesn’t work so we can fix it. I hope you’ll find it easier to navigate than the old site! We’ve been working so much at Everyday Education that I haven’t yet had a chance to dust off this blog and put it in order after the move from Janice-Campbell.com, but we hope to work it soon as well. Thank you for sticking with us through the move! In the c. 1530 allegorical portrait of Dante Alighieri by Agnolo Bronzino (above), Dante holds a copy of the Divine Comedy, open to Canto XXV of the Paradiso. The painting is public domain, courtesy of Wikimedia Commons. Have you tried the wonderful planning and organizing tool, Trello? I’ve been using it for over a year, and need to do a post on it, but until I get that done, you can get an idea of how it works at its homepage. What I like about it is that it works pretty much like my mind works, it’s easy to use (drag and drop), and it’s free. If you upgrade to the next level, you can have pretty backgrounds to your boards, but you don’t have to do that. The free version does everything, as far as I can tell. Any book links in the post are Amazon affiliate links. You can read about them in the footer below.